2.52 carat (1.52 ct center) Platinum Halo Dream Ring! Home » Lab-Created Center » 2.52 carat (1.52 ct center) Platinum Halo Dream Ring! 1.52 CT ideal cut round diamond set in a platinum split shank halo setting. 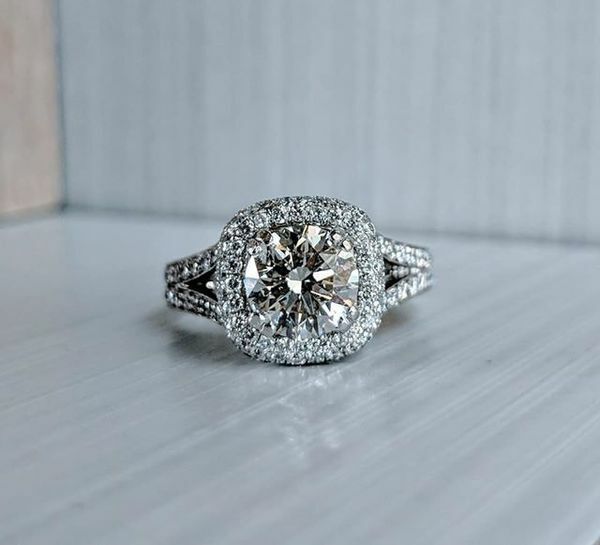 This is the definition of a *dream* ring! The setting has 1 carat of diamonds covering it on every side. Over 2.5 carats of diamonds set in platinum for just $4500!!! Center diamond is a REAL diamond, lab grown and certified with laser inscription for easy authentication and identification. Size 6.75 and sizable.